You are here: Home / What’s New / new products / Exciting New Hair Care and Styling Products at Vincent’s! At Vincent’s Den for Men, we understand the importance of staying current. With the constant change in trends and products, we want to make sure that you are kept up-to-date. We want only the best for our customers. When a new, great quality product becomes available, we make sure it is brought into the store. Along with a great haircut, we want you to have a wide variety of quality hair products to choose from. Our passion is hair and we want to help keep your hair looking great! Part of our job is keeping up with our suppliers, current and new. When American Crew recently released new products, we had to bring them in. Just this week, we have brought in several new products for you. American Crew 3-In-1 – A tea tree shampoo, conditioner, and body wash, all in one bottle! This invigorating cleanser stimulates the hair and scalp, while conditioning, detangling, adding shine to the hair, and softening the skin. The perfect all-in-one product, ideal for travel or the gym. 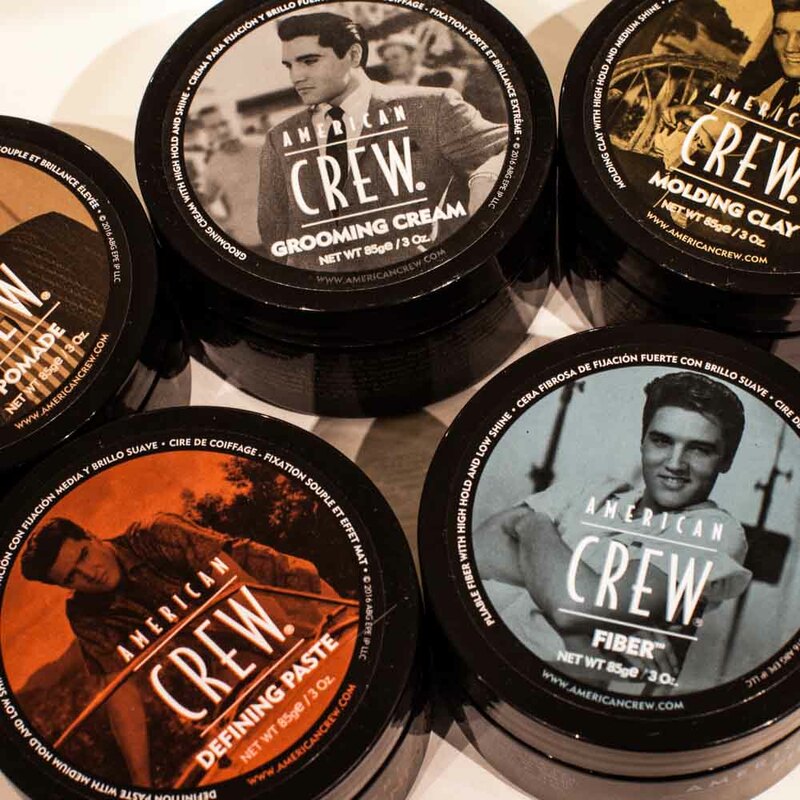 Elvis Presley editions of the classic American Crew jar products – Including pomade, molding clay, defining paste and forming cream. Stop in at Vincent’s Den for Men to choose from our full selection of American Crew hair care and styling products. Vincent’s is the destination for your hair care and styling needs. Whether you need to pick up your reliable favorite or want to try something new; stop in at Vincent’s.